Sorting out the chart question for the Race to Alaska has been an ongoing process. The choices range from stacks of paper charts, to dedicated electronics, to computers or iPads with chart software. A full collection of paper charts to cover 750 miles is both expensive and heavy. On the other hand, electronic charts can be hard to read, and suffer all the failure possibilities of anything electronic. I can imagine few things more unnerving than to be out on the water in an unfamiliar coastal area with a piece of dead electronics, and nothing more than the sketches in the cruising guide (covering only immediate harbors) for any information about water depths, and the existence of both channels and rocks. 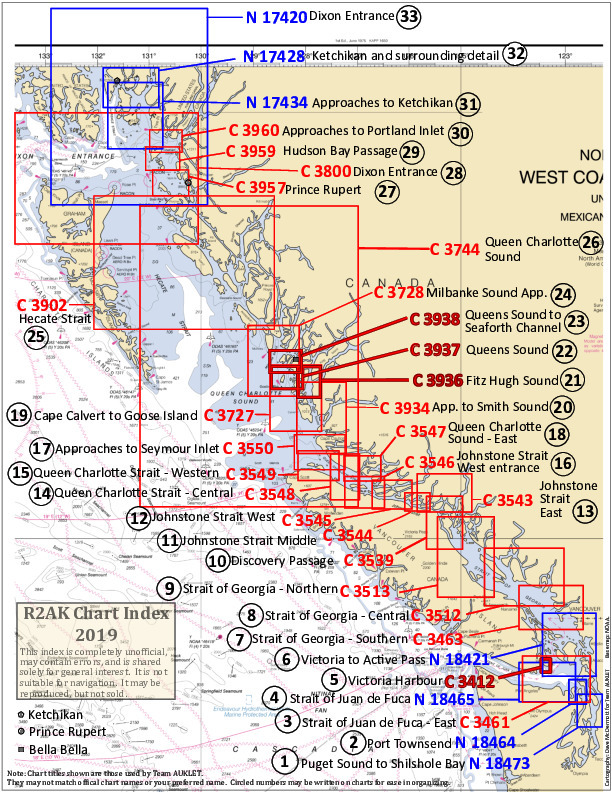 Chartbooks of reprinted government-produced charts, that are so convenient on US coastlines, do not appear to be available for the Canadian shore, possibly due to copyright issues with the Canadian government; NOAA charts in the US may be freely copied by anybody, including for secondary sale. There is a set of independently produced chartbooks, Marine Atlas, for which I had high hopes originally. Alas, volume 1 is in truly microscopic print (reading glasses + magnifying glass), and volume 2, for the more northerly section of the trip, does not show water depths, or latitude and longitude scales at the edges of each page. That last is a total dealbreaker. As a result of all the above considerations, Team AUKLET will be carrying quite a few paper charts, along with a handheld chartplotter, and a Surface Pro 4 computer with additional electronic charts. But the paper charts will be our primary navigation resource. The computer uses too much electricity for routine navigation, and the handheld chartplotter can be seriously less than clear. I considered adding a hardwired chartplotter to the boat, but the combination of installation time, expense, and puzzles about where to locate it all nixed that idea. Besides, I really like paper charts: they are reliable, they show the big picture, and they add nothing to the electricity budget. The hardest part about using individual charts for a long trip, to me, has been trying to keep them organized so it’s possible to find the right one at the right time without a crazy search. Sailing the New England coast, most charts are available in big Maptech chartbooks, with page numbers and an index chart at the front that has outlines showing the coverage for each individual sheet. Eventually it occurred to me that it would be ideal to have exactly such an index for the charts carried on the boat for the r2ak. Over the last few weeks, thanks to my cartographer friend Dave McDermott, we have been developing exactly that. The charts will be folded in quarters, plain side out, with large numbers written in a consistent corner of the fold; those numbers will correspond to the circled numbers on the chart index. One might think that the overall chart indexes/catalogs available from NOAA and from the Canadian Hydrographic Service might do this job, without nearly so much extra work. But there are so many charts outlined in those catalogs that it truly becomes spaghetti, making it far from straightforward to sort out which is which. It has felt important, especially given the possibilities for functioning while seriously tired, to make this as simple as possible. Thank you Dave! For those in serious suspense, news is that boat transport now has a plan – more on that soon. Thank you Chris Shelton!